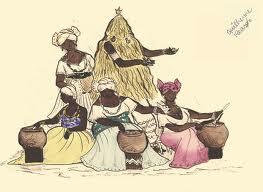 Olubaje is a feast that plays an important role in Candomble’s ritual calendar. Food for Obaluaye (or Omolu) and all of the Orixas is prepared and served to the public to participate in this sacred cleansing meal. Praising Omolu during the Olubaje is how we pray for the health and well-being of the members of the community. The Olubaje shares some similarities with the Lukumi Awan or Agban ceremony, where lots of food is prepared and people sing and dance in praise. During an Olubaje, it’s important that each person present eats a little of each dish presented – typically well over a dozen meals. In Candomble, we greet Omolu by saying, “Atoto,” which calls for silence. Unlike other meals where people may talk and joke around, this sacred meal calls for silence and reverence. Eating the food is in and of itself an act of prayer. In this short documentary of an Olubaje feast for Omolu in São Paulo featuring Iyalorixa Wanda de Oxum, we see the terreiro preparing for the feast. YouTube enables Closed Captions; the translation is bad (many words are mistranslated because of accent/ambient noise), but with the captions on you can get the gist. ← What do you mean, there’s no Oriate?!? !